Now, Olga Mikhaylichenko and colleagues in Eileen Furlong’s group at EMBL have gained new insights into the role of enhancers and promoters during embryonic development, a life stage where very tight regulation of gene expression is essential. Furlong explains the main findings of the paper, that explores the balance between enhancer and promoter activity within individual regulatory elements in vivo, and that was published in Genes & Development on January 29. It used to be thought that there was a black-and-white distinction between enhancers and promoters: they can only act as one or the other. Our paper shows that there is actually a large grey area in-between, with elements that can perform both functions to varying degrees. The level of enhancer or promoter activity is reflected by both the amount and the direction of transcription from the regulatory element, so whether the element can be read in one or two directions, unidirectional or bidirectional. We also developed a new framework to measure enhancer and promoter activity for the same element, in the same embryo (see figure), which we suggest should become the standard for future studies. First of all, we were able to show that things are not as black and white as they seemed. Enhancers and promoters are in various states of evolution with some having exclusive promoter function, others having predominantly enhancer function, and yet other elements, distal enhancers, having weak promoter activity. Hints from other studies suggest that these general features are conserved from fruit flies to humans. 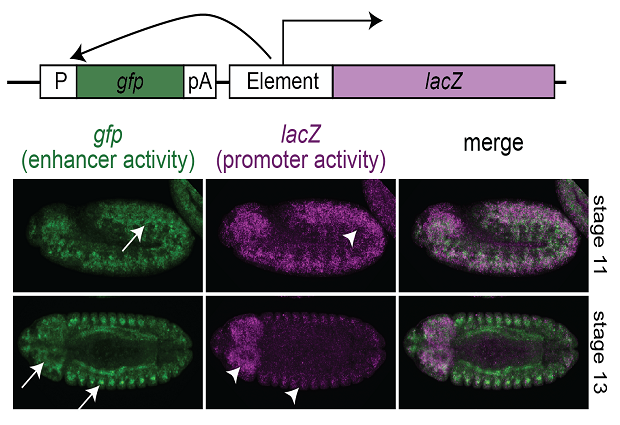 Our findings uncover a new aspect of promoter and enhancer function during embryogenesis, and provide interesting insights into how these elements might have evolved to regulate robust embryonic development. Mikhaylichenko O, Bondarenko V, Harnett D et al The degree of enhancer or promoter activity is reflected by the levels and directionality of eRNA transcription. Genes & Development, published online 29 January, 2018.